A Catholic procession in Downtown Orlando, Florida, sometime between 1939 and 1941. Altar servers are followed by the bishop, priests, and congregants. In these processions, a cross bearer and candle holder, who are not pictured, led the procession and were followed by any extra servers, deacons, priests, and in this case, a bishop. If a bishop is present, at least two servers will follow behind to be ready to take his crosier and his mitre. During a Confirmation ceremony or any other special mass, members of the congregation may process in between the cross and candle bearers and the deacons. 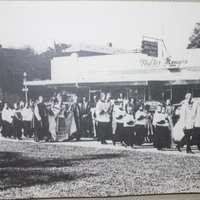 In the background, a sign for Walter Menges' Clothier To Men can be seen. The store was located on North Orange Avenue in between Jefferson Street and Robinson Street. Other shops near here included a Rexall drug store and Brenner's Ladies Dress Shop. Original black and white photograph: Orlando Remembered Exhibit, Downtown Orlando Post Office, Downtown Orlando, Florida. Comas, Martin E. "Walter A. Menges' Store Suited Customers Just Fine." The Orlando Sentinel, March 7, 2002. http://articles.orlandosentinel.com/2002-03-07/news/0203070235_1_menges-daughter-clothier. “Catholic Mass Procession.” RICHES of Central Florida accessed April 21, 2019, https://richesmi.cah.ucf.edu/omeka/items/show/5586.